Fans of the Brontë sisters often wish that Charlotte, Emily & Anne had lived long enough to write a few more novels. Charlotte made a tentative start on a novel after her marriage & Emily may have started a second novel (& Charlotte may or may not have destroyed the manuscript after Emily's death), but really, seven novels between them just isn't enough for the devoted admirer. However, the three sisters & their brother Branwell did write a lot more. All through their childhoods, from the moment when their father brought home a box of toy soldiers, the Brontës turned the soldiers into characters in two long-running sagas. Emily & Anne created Gondal &, although they were still imagining Gondal into their adulthood, virtually nothing survives of these stories except some poetry. Branwell & Charlotte created Angria, an imaginary place which is a mixture of Africa & Yorkshire. A lot of the Angrian stories survive & I've been reading the last five novellas (or novelettes) that Charlotte wrote about Angria. These stories were written when Charlotte was in her early twenties, when she was at home at Haworth, on holidays from her teaching position at Roe Head School & after the end of her position as a governess, working for the Sidgwick family. This Penguin Classics edition is beautifully edited by Heather Glen & includes copious notes explaining obscure political references & illuminating the relationships between the characters. Even so, I soon decided that I couldn't get too caught up in who everyone was & their backstories, it was just too confusing. Even more confusing, characters often change their names between stories or are addressed as one name by one character & something else by another. This is natural in such a long-running story, all the nuances of which would have been appreciated by the original readers, the Brontës themselves. The main characters are Arthur Augustus Adrian, Duke of Zamorna, King of Angria. Zamorna is married to Mary Percy, daughter of his once great friend & now enemy, Alexander Percy, Duke of Northangerland. Northangerland is married to Lady Zenobia Ellrington, who was once in love with Zamorna but married Northangerland on the rebound. Our narrator is Charles Townshend, cynical man about town & aspiring writer. Townshend was once Lord Charles Wellesley, brother of Zamorna in his younger days when he was Marquis of Douro, son of the Duke of Wellington. Mina Laury - Zamorna has returned from exile after the civil war & is now King. Northangerland has been sent into exile but, because of their family relationship, Zamorna & Mary still visit him. Mary has become jealous of Zamorna's many love affairs & is now a shadow of the woman she once was. Zamorna's first love, Mina Laury, shared his exile with him & is still his mistress, living in a remote country house. Lord Hartford, one of the Generals in Zamorna's army, has long been in love with Mina & visits her to declare himself & ask her to marry him. Zamorna discovers this & challenges Hartford to a duel. Stancliffe's Hotel - Charles Townshend & his friend, Sir William Percy, see a beautiful young lady in church, Jane Moore, daughter of a prominent barrister. After seeing her out riding, Percy declares himself in love & they decide to visit her, claiming to be clients of her father (who they know to be out of town). Jane receives them politely but is obviously under no illusions as to who they are, thinking them counting house clerks on a joke. Zamorna's continuing relationship with Northangerland is leading to political instability & a riot threatens to break out. Zamorna & his Duchess arrive & he quietens the rebels. The Duke of Zamorna - Townshend begins by reliving events of the past. He remembers the younger days of Zamorna, then the Marquis of Douro; his friendship with Northangerland; Northangerland's despair after the death of his first wife & his relationship with Louisa Vernon which resulted in the birth of his daughter, Caroline. Then, we're back in the present day & Townshend's friendship with Sir William Percy continues with a series of letters written by Percy about Angrian society occasions. This is really a series of sketches which move about in time but illuminate the pasts of some of the characters from the first two stories. Henry Hastings - Sir William Percy is now working for the Government & has become more serious, undertaking undercover diplomatic missions. Townshend, on the other hand, is much the same. He tries to make conversation with a young woman on a coach journey. She is Elizabeth Hastings, who has been employed as a companion/governess to Jane Moore. Elizabeth's brother, Henry, is an outlaw, a poet & a drunkard, who was once thought to have a promising military career until he shot his commanding officer. After years in exile, Henry has returned to Angria & Percy is on his trail. He traces him to a country house belonging to the Moore family where Elizabeth is staying alone as housekeeper. Caroline Vernon - Caroline is the illegitimate daughter of Northangerland & the ward of Zamorna. Caroline is now a teenager, desperately bored living with her mother in the country & full of dreams of fashionable life. Northangerland decides to bring her out & she experiences society in Paris & Verdopolis, the capital of Angria. He is reluctant to introduce her to his own home or his wife & so she is sent back to her mother. Caroline is dissatisfied by her return to the country & runs away to find Zamorna, with whom she has become infatuated. Zamorna is true to his Byronic nature & seduces Caroline, proposing to set her up in the country as his mistress. Northangerland discovers what has happened & the two men have a violent argument which is where the story ends. Soon after Charlotte wrote Caroline Vernon, she worked as a governess for a few months with the White family & then she & Emily went to Brussels. 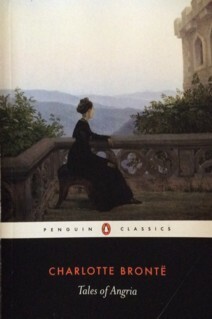 There's no evidence that she wrote any more Angrian stories or anything else (although there's a fragment of a novel set in Yorkshire) until 1846, when, after the failure of their book of poetry, Charlotte tried to publish her novel, The Professor, along with Anne's Agnes Grey & Emily's Wuthering Heights. The last two stories in this collection - Henry Hastings & Caroline Vernon - are longer & more coherent narratives. I enjoyed all the stories but especially those two. Throughout the stories, Charlotte's distinctive voice can be heard,. She often addresses the Reader, as she does most famously in Jane Eyre. 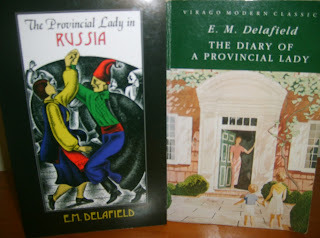 Her descriptions of place, particularly wintry landscape, & her scene setting are as good as anything in the novels. The wind increased, the sky darkened, and the bleached whirl of a snow-storm began to fill the air. Dashing at a rapid rate through the tempest, an open travelling carriage swept up the road. ... It contained two gentlemen, one a man of between thirty or forty, having about him a good deal of the air of a nobleman, shawled to the eyes, and buttoned up in at least three surtouts, with a waterproof white beaver hat, an immense mackintosh cape, and beaver gloves. His countenance bore a half-rueful, half-jesting expression. He seemed endeavouring to bear all things as smoothly as he could, but still the cold east wind and driving snow evidently put his philosophy very much to the test. Mina Laury. Sometimes when she was alone in the evenings, walking through her handsome drawing-room by twilight, she would think of home and long for home, till she cried passionately at the conviction that she should see it no more. So wild was her longing that when she looked out on the dusky sky, between the curtains of her bay-window, fancy seemed to trace on the horizon the blue outline of the moors, just as seen from the parlour at Colne-moss. The evening star hung above the brow of Boulshill, the farm fields stretched away between. ... Again, the step of Henry himself would seem to tread in the passage, and she would distinctly hear his gun deposited in the house corner. All was a dream. Henry was changed; she was changed; those times were departed forever. She had been her brother's and her father's favourite; she had lost one and forsaken the other. At these moments, her heart would yearn towards the old lonely man in Angria till it almost broke. But pride is a thing not easily subdued. She would not return to him. Henry Hastings. Heather Glen's Introduction is very interesting in discussing the origins of the stories. Unlike other critics, she doesn't see them as a form of "trance-writing". She sees them as a response to the fiction that the Brontës were reading in the 1830s - the fashionable silver-fork novels, the Newgate novels about criminals & prisons & Gothic novels. There was also a vogue for short tales & sketches in the periodicals & newspapers of the time so the form of these stories may have been deliberate. Charlotte may not have wanted to write full-length novels although she also lacked the time to write longer narratives when she was teaching. Glen points out that Charlotte was in her twenties, the same age as Dickens was when he published Pickwick Papers. These Angrian stories satirise many of the conventions of the fiction of the day & there's an exuberance in the telling of stories for her siblings who would understand the allusions to the popular books they had read. As in all her work, Charlotte's own wide reading, especially of poetry & the Bible, is referenced everywhere. Charlotte was also in a conversation with Branwell in these stories, taking over one of his characters (Henry Hastings) for her own & turning him into a commentary on Branwell's own dissolute habits. She even resurrected a character (Mary Percy) that Branwell had killed off in one of his stories. I loved reading these tales of Angria. I think that anyone who craves more Brontë stories should give these a try & this edition is an excellent place to start. Gosh Lyn, I hd no idea, thank you for a lovely Tuesday morning discovery. You're welcome! It's a lovely autumn day here & we had some rain last night so it's a good day.